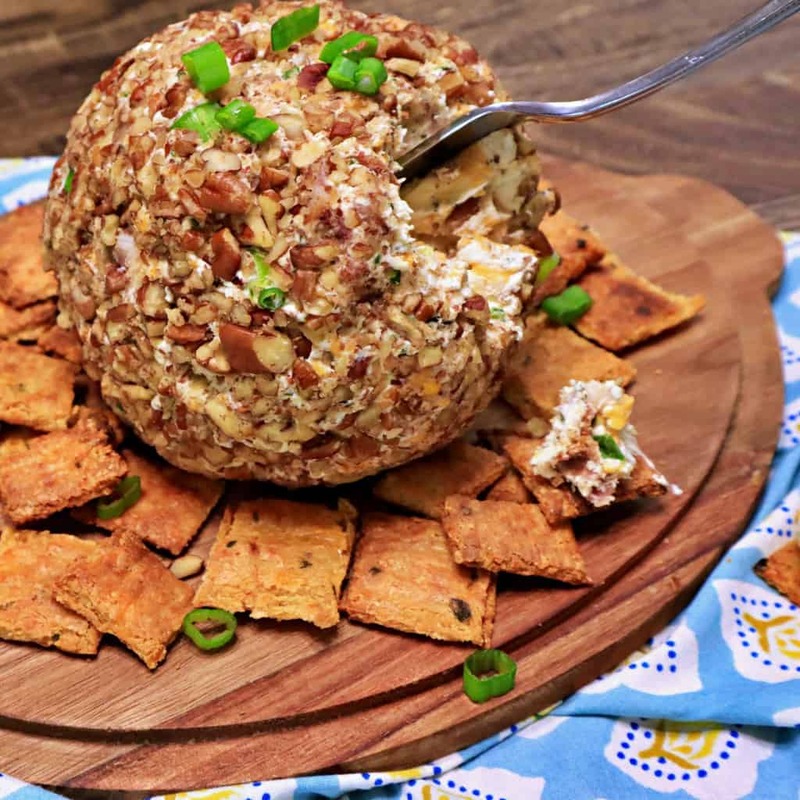 This Keto Cheese Ball is delicious, especially with these Chive Cheese Crackers we show you how to make too. These are great to make ahead (in similar or even smaller batches), and they are also great for potlucks, parties, and other social gatherings. Even your friends and family who don’t eat the Keto way will think this thing is delicious. You’ll probably have to tell them to pace themselves on the Cheese Crackers too. One of the things that a lot of people who eat Keto tend to tell us that they struggle with is staying the course when they are around other friends and family who just eat “normal”. Having a recipe for a Keto-Friendly Snack like this means that you can bring something with you to someone’s house or into work that everyone can equally enjoy that doesn’t look or taste like Diet Food. Plus something fun like this makes a delicious centerpiece for the Coffee Table or Appetizer Table. Start off by preparing the ingredients to go inside of the Keto Cheese Ball mixture. First Chop the fresh Green Onions, then Chop the Pecan Pieces into small Chunks. Lastly, Shred the Cheddar Cheese with a Cheese Grater. In a Large Frying Pan over Medium-High Heat, cook the 8 strips of Uncured Bacon. When the Bacon is fully cooked, transfer it onto a plate lined with a paper towel to capture excessive bacon grease. Then chop the Uncured Bacon into small pieces. In a Large Mixing Bowl add 16 ounces of Cream Cheese that has been softened on the counter beforehand (makes it easier to mix). Add in the Green Onion, Bacon, and Cheddar Cheese to the Cream Cheese. 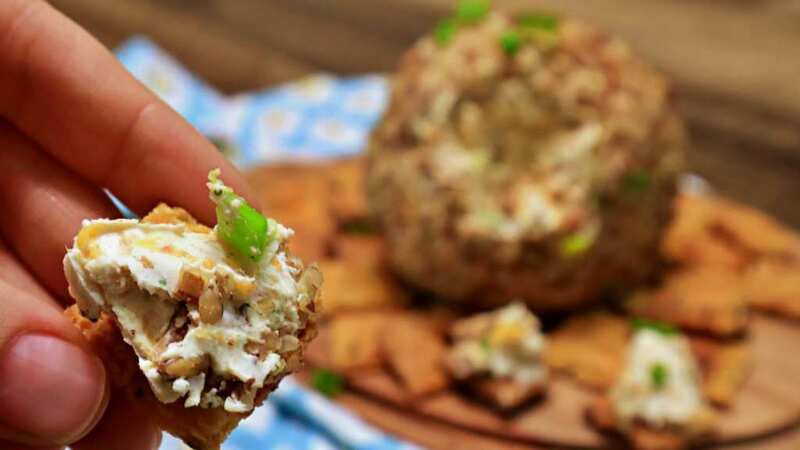 Season the Cheese Ball mixture with 1 Teaspoon Dried Parsley, 1 Teaspoon Granulated Garlic, 1 Teaspoon Onion Powder, 1 Teaspoon Dried Onion, 1 Teaspoon Dill Weed, 1 Teaspoon Dried Chives, 1/2 Teaspoon Black Pepper, and 1/2 Teaspoon Pink Himalayan Salt. Mix all of the ingredients in the bowl really well until all of the seasonings are evenly distributed throughout. Then form the mixture into a ball shape with your hands. On a Large Plate or Large Shallow Bowl add the Chopped Pecans. 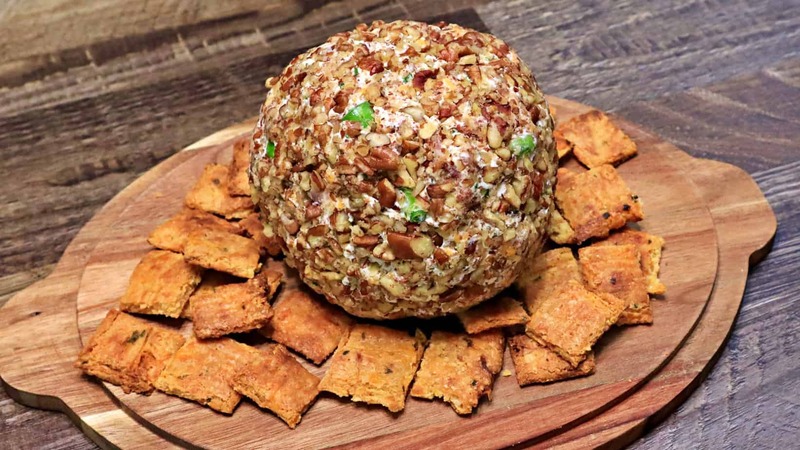 Take the Cheese Ball and coat it in the Pecans by setting it down into the Pecans, and then picking it up and gently rotating it until the entire Cheese Ball is coated in the chopped Pecans. Set a sheet of Plastic Wrap flat on the counter, and place the Keto Cheese Ball in the center of it. Wrap it, and place it in the Refrigerator for at least 1 Hour prior to serving it to allow it to properly chill and firm up. Pre-Heat the Oven to 450*F.
In A Large Frying Pan over Medium Heat warm up 3/4 Cup Parmesan Cheese, 3/4 Cup Romano Cheese, 1/2 Cup Cheddar Cheese, 1 Cup Almond Flour, and 2 Ounces of Cream Cheese, then stir them together until partially melted (but not fully cooked). Season the Cheese Cracker Mixture with 1/2 Teaspoon Pink Himalayan Salt, 1 Tablespoon Dried Chives, 1 Tablespoon Granulated Garlic, and then whisk up 1 Large Cage-Free Egg and pour that into the Cheese Cracker Mixture too. Line a Baking Sheet with a piece of Parchment Paper and then scoop out the Cheese Cracker Mixture into the middle of it. Cover the mixture with another piece of Parchment Paper, and use your hands to press the cracker mixture as flat and even as possible. Using a Pizza Cutter slice the crackers into your desired sizes and then transfer them to the oven to cook for about 5 to 8 Minutes per side (Flipping them carefully halfway through). Remove the Crackers from the Oven and cool on the counter for a few minutes before carefully breaking them apart. These cheese crackers look like exactly what I was search for! Yum. One question…. I’m not clear on when you put in the egg. Do you put it in while the cheese mixture is on the heat and cook the egg in the pan? or is the mixture off the heat and the egg added and doesn’t get cooked in the frying pan but mixed into cooling cheese and cooked when it is baked? The former sounds like scrambled egg and cheese. You’re welcome. I tried my best make the written recipe as clear as possible for it since it’s two recipes in one. 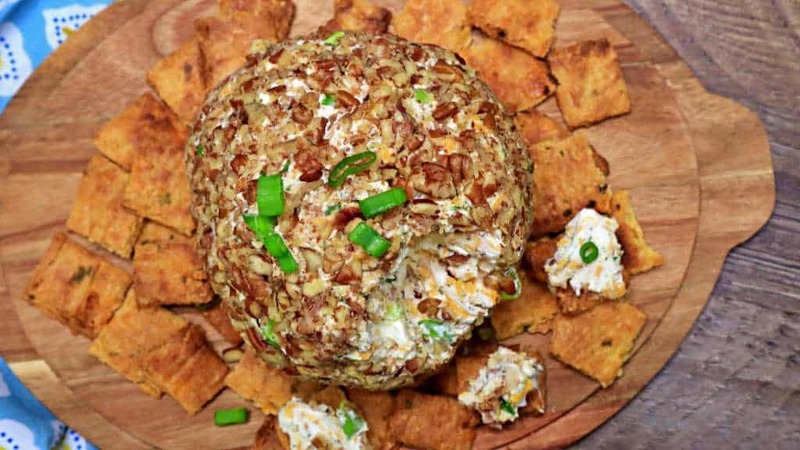 Hadn’t exactly done that before, but wanted to show something tasty you could spread the cheeseball onto instead of just veggies. Is there a less expensive substitute for the romano cheese? I am not able to find Romano cheese near me. I have checked several places, and I have several recipes that call for it. Can I sub in coconut flour for the almond? 1/4c to the 1c?